When did steampunk become so popular, would someone tell me? I went to Arisia for the first time this year, which, for those who don’t know, is a yearly science fiction and fantasy convention in Boston. Now, admittedly, my convention-going experience is limited. When I was a kid, I used to go to some of the local comic book and Star Trek conventions, but that was over twenty years ago. Last year, I went to a horror convention called Rock and Shock, in Worcester, Massachusetts, and a horror writers’ convention called Anthocon in Portsmouth, New Hampshire. Neither one of those prepared me for the spectacle I would find at Arisia. I had expectations for Arisia. I’ve seen these kinds of things on tv, so I thought I would find a bunch of people dressed up like Starfleet officers, Klingons, Jedi, Hobbits, Elves, and Battlestar Galactica pilots. My expectations were, however, blown out of the water. Instead, it seemed like every science fiction fan woke up one morning and said, “Hey, I finally get that 1960s television show, The Wild Wild West. You know the show, right? Robert Conrad and Ross Martin were James West and Artemus Gordon. These two were a couple of James Bond types during the time of the Old West. It was half science-fiction, half western. The gadgetry they employed was far in advance of what you would expect for the period, with things like cyborgs, force fields, flamethrowers, and batman-style grappling hooks. 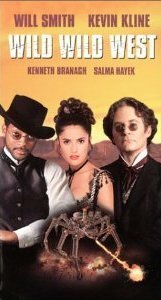 The 1999 version starring Will Smith and Kevin Kline really sucked, but they played up the whole steampunk angle even more than the series. So that’s what steampunk is, this blending of Old West and Victorian era time period with science fiction elements. If the the Arisia I attended is representative of what it is usually like, they could just call it a steampunk convention. There were plenty of people dressed up in costume, that’s true, but most of it had that steampunk theme. I saw one Starfleet uniform, one hobbit, and a couple of guys who might have been Jedi, but they didn’t have light sabers, so I couldn’t be sure. Dressing for the occasion seems to be the way to go at one of these things too, as I would say a good three quarters of the convention-goers showed up in costume. I was in the minority. It was fun to go there and people watch, though. Let me tell you something; nerd girls dress up in some of the, ah, *ahem*, most appealing costumes you could imagine. I’ll admit they surpassed what I expected. There may not have been any Slave Leias, but there was a scantily clad elven archer from the Lord of the Rings or Skyrim, a seductive assassin from the video game Assassin’s Creed, and a very revealing Poison Ivy from Batman wrapped in only, you guessed it, ivy. All right, so I still decided I would go in there and enjoy myself. I like Doctor Who, Star Wars, Star Trek, Battlestar Galactica and Babylon Five as much as the next geek. Stepping into the dealer room was like entering some alternate universe, where geeks didn’t even know who the Doctor, Captain Kirk, Han Solo or Starbuck were. I wandered around and checked out everything they had to offer, but nothing really jumped out at me. I’m amazed to say that I walked out of Arisia without purchasing a single thing. When I went into the dealer room, however, it seemed the dealers got the same memo that everybody else did. It was Steampunk Central in there. I’m an introvert by nature and I have to admit that I found the place to be a bit overwhelming. I think I could have settled in better if I found some of the familiar Harry Potter and Star Wars elements that I expected to, but those things were almost non-existent, except for one notable exception. One of the highlights of the day was a life-sized stormtrooper cake that was on display. Towards the end of the day, it was sliced up and served to a very long line of hungry Star Wars fans. I passed on that, because hey, how good could it really be? If it was Darth Vader cake, maybe, but stormtrooper? It was probably just a cloned recipe, anyway. The biggest lesson I learned from this convention, was that I should have made myself familiar with the schedule before I even walked in the door. There were hundreds of events that included movies, seminars, discussion groups, and even combat sword training. I know I would have enjoyed a bunch of those, and next time I intend to have a plan of attack. I missed the discussion I had planned to attend, which was a panel of critics wrapping up the science fiction movies from 2011. A friend of mine, Woody Bernardi, had what they call a “fan table.” Woody started a group called the Boston Science Fiction Association, which is really just a bunch of fans who get together and hangout sometimes. He got the fan table to drum up some more interest in the group. So far we’ve mainly been getting together for lunch at the Tavern at the End of the World, in Charlestown, Massachusetts. I agreed I would take a turn watching the fan table for Woody so he could go to some of the discussion groups that interested him. I think he was particularly interested in a tribute to Anne McCaffrey. I was happy to sit down and unwind a bit. I actually talked to more people sitting at that table than I had wandering around the crowded dealer room. I look forward to the next one, though, now that I’ve had a chance to process the experience. As a writer, I dream of a day when people will be dressing up as characters from my fantasy novels. That would be something to see. Would I go in costume? I don’t think I’m ready for that yet. Of course, my ultimate goal is to be one of those guys sitting behind a table with a long line of people waiting to see me. I’ll be serving the Darth Vader cake, of course. I think the steampunk theme dominated because of the Guests of Honor being Phil and Kaja Foglio — creators/writers of Girl Genius. Yes I believe that may have tipped the balance a bit, however I’ve been noticing an upward trend of Steampunk at Arisia over the past few years…. Hi Mark and Penny, I am the writer of this article. Thanks for the info on Arisia. I knew very little about it going in. I will be more prepared next time. Boskone is this weekend, and it’s another one I’ll be going to for the first time.